Coal proponents have advertised they will use new technology to shield port workers and their West Oakland neighbors from the toxic, corrosive, and explosive dangers of transporting coal through the former Oakland Army Base. 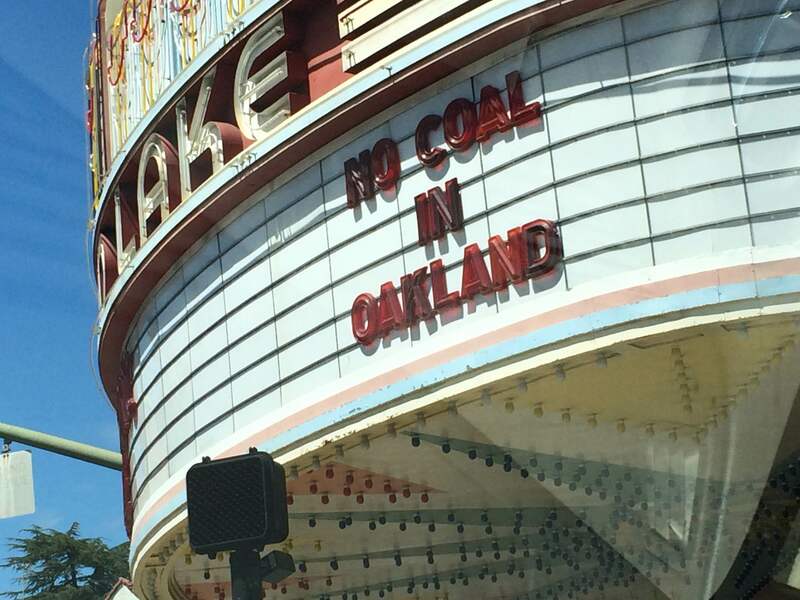 But fantasies can’t protect Oakland’s workers and families from coal’s frighteningly real threats. Up to 620 tons of dirty coal dust blown into West Oakland every year? That’s what a Public Health Advisory Panel on Coal in Oakland figures in their report, An Assessment of the Health and Safety Implications of Coal Transport through Oakland . It can spontaneously burst into flame in its solid form (in fact, combustibility is why coal is dug out of the ground in the first place). It’s highly explosive when suspended as dust particles in confined spaces, such as covered railroad cars and enclosed coal terminals. Coal is toxic to humans, especially when inhaled as dust. Coal dust is filthy: if coal is shipped through Oakland, 90-620 tons of black, sticky particles will get into and onto everything in its path — from homes to cars to clothing to playgrounds — each and every one of the 66 years the Oakland Bulk and Oversize Terminal (OBOT) is leased to coal profiteers. Coal proponents claim that technology can protect against potential harms. But the proposed technology is unproven, and in some cases has never been tested in real-world conditions (i.e., has not been field-tested). Claims that the coal terminal would be wholly enclosed is not how existing coal terminals are designed or implemented, and these claims run contrary to design documents submitted by coal project advocates. For example, by the developers own admission (in its “Basis of Design” document), the stockpiles of coal will be moved from the domed terminal to be stored outdoors for unspecified lengths of time before being loaded onto ships. In the description of its enclosed conveyor system, the Basis of Design document reveals that different types of conveyors will be used, depending on the phase of coal transfer, and not all of them will be covered. All indicators point to the likelihood that a “wholly enclosed” terminal is at best an untested fantasy, and at worst a bait-and-switch lie. Filtering technology creates potential for fires like one reported earlier this month in a dust collection system at the John Twitty Energy Center in Springfield, Missouri . Though filtering and wetting strategies may be used if coal ships through Oakland, “no safety analysis has been conducted for the potential transfer of bulk coal through OBOT” . The Public Health Advisory Panel on Coal in Oakland report offers 145 well-researched and footnoted pages of reasons to distrust assurances that grievous hazards can be magically neutralized by technology that is unproven, uneconomic, or ‘optional’ at the discretion of profit-motivated coal proponents. There is only one way to protect our workers and communities from coal hazards: banning its transport through Oakland and its port.